High performance GRP composite doors designed with 44mm thick, fully insulated door slabs for maximum thermal performance and security. Our leading composite door frames are produced with a choice of Deceuninck’s 2500 chamfered or 2800 decorative profile systems. Create a lasting impression with our beautiful and traditional composite doors. Designed in the likeness of timber, our timeless composite doors will complement any period property as well as lending a classic touch to today’s modern home. Our elegant designs are combined with a highly robust structure, creating a remarkably strong and durable door. Now you can benefit from a traditional style without compromising on energy efficiency or security. As the entrance to your home, your front door says a lot about you so why compromise on looks. Our high-definition composite doors feature advanced GRP skins which give you a real timber appearance, with mouldings which give the feel of a traditional wooden door. All our composite doors and composite back doors can be customised and tailored to suit any personal taste and property. As composite door manufacturers, we know how to build powerful and long lasting doors. 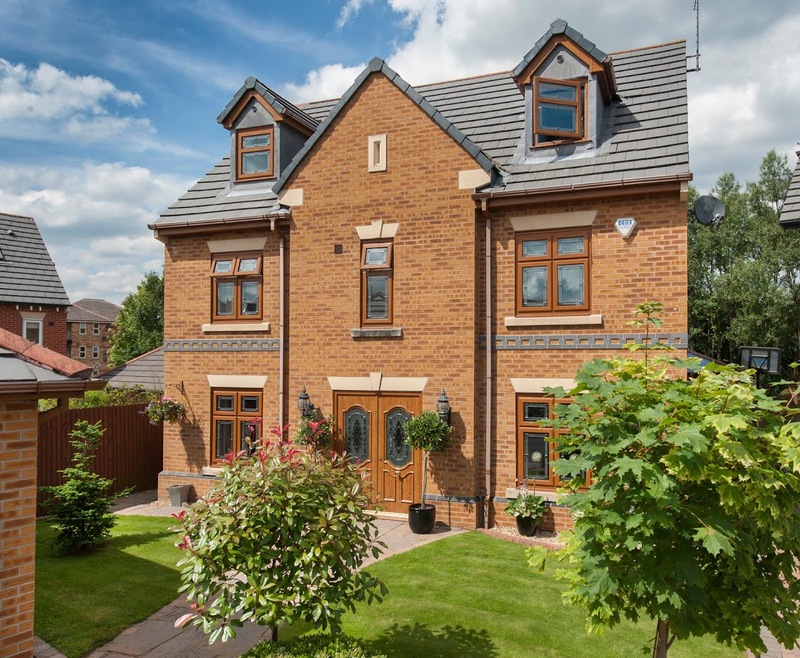 Our composite doors are manufactured using the latest uPVC technology with advanced locking systems which offer exceptional security and durability. Our composite exterior doors are extremely low maintenance due to a durable Glass Reinforced Plastic skin (GRP) that prevents the door from warping, rotting or twisting. It also means your composite door will never require re-painting. Our foam filled composite doors achieve an impressive U Value of 1.0 W/m²K or more, with thermally efficient glazing panels. On average, our external composite front doors are 15-20% more efficient than solid timber doors. Our beautiful looking composite front doors and external back doors are complemented by the latest security hardware. We use multi-point locking systems to make our composite doors that extra bit secure. Our composite doors have an internal construction of timber, LVL and composite material, combined with a high density polyurethane core. This makes them incredibly weather resistant so that they remain stable whatever the weather. Our composite doors are available in many different styles, colours, hardware options and glass designs. They can be customised to suit any taste, enabling you to maximise the opportunities presented by this market. The door slabs we use are complemented by an incredibly sturdy structural frame and the latest hardware, making our doors even more secure. Our door slabs feature fully reinforced, 2mm thick GRP skins which have been regularly tested at BM Trada and are designed to exceed the current standards. A CFC free polyurethane insulating core provides superior thermal performance as well as enhancing sound proofing. Our doors have a 2mm bow tolerance compared to the standard 5mm. They use a high grade LVL, laminated veneered lumber which protects the frame from moisture making it less likely to warp, twist or bow. We offer beautifully designed marketing literature showcasing our composite door styles and options to help your customers find their dream entrance door easy and hassle-free. Our composite door range is available in virtually any colour. 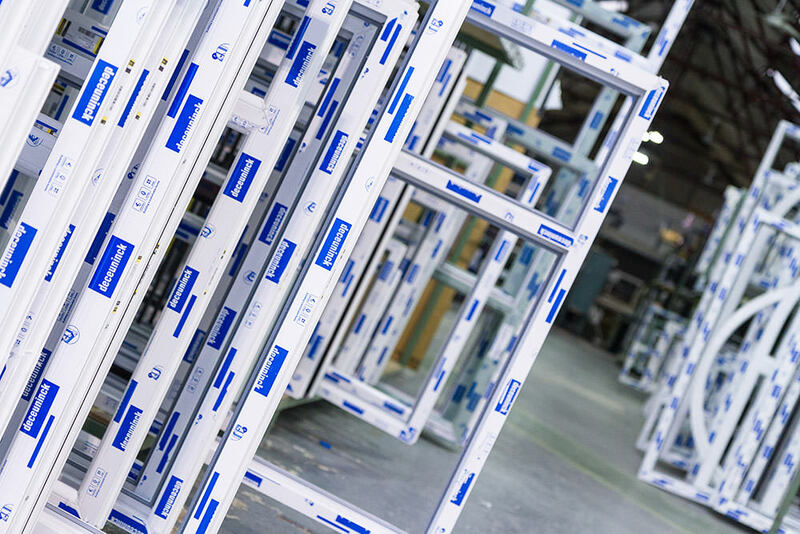 This includes our standard range of White, Red, Green, Blue and Black to bespoke laminated foils and a premium range of RAL coloured doors. Our incredible Deceuninck composite doors offer strength and durability like no other door. These high performance front doors have typically 60% more structural integrity than solid timber doors. They come with a 70mm outer frame as standard and have a 2mm GRP ( Glass Reinforced Plastic) outer skin which is tremendously tough to enhance durability. Three pencil-style multi-adjustable hinges ensure a perfect fit. The energy efficiency and weather resistance achieved by these incredible Deceuninck composite doors is impressive. They provide an exceptional level of insulation which makes them 15-20% more thermally efficient than solid timber doors. Also included is a low sightline grey rolled gasket and weather seal. Whatever the weather, you’ll enjoy a warm and dry home. Some of the options available to you include low thresholds for easy accessibility as well as a number of design choices such as chamfered or contoured profiles. We have a huge variety of colour finishes to choose from, and with the incredible durability of the GRP outer skin, you can be sure that whatever colour you choose will remain looking spectacular for many years to come. We use multi-point locking systems, with two hooks, rollers, deadbolt and one soft latch. What’s more, we also offer the option to upgrade to Secured by Design accreditation, with the addition of laminated glass, extra reinforcing and anti-snap/drill barrels. Our composite doors can also be spray painted in any RAL colour, and are available with a wide variety of glazing options, opening up hundreds of possible options to explore to obtain a door like no other. Our use of reflective paint also means that dark colours remain cooler, further reducing the likelihood of bowing which is why our door slabs carry a 25 year structural guarantee. Our doors can also be spray painted in any RAL colour, and are available with a wide variety of glazing options, opening up hundreds of possibilities for your clients to explore should they wish a door like no other. Get a free composite door quote today. Contact us for instant composite door prices.